Kira, whose father died before she was born, has just lost her mother. She is now an orphan, who was born with a disfigured leg, making her undesirable in the society in which she lives. Despite this ailment, Kira has a gift: an innate ability to create beautiful embroidery. Her mother taught her to weave, but it is her gift that lands her the prestigious role of caring for the Singer's robe. The Singer is the one who presents the Ruin Song each year, so everyone can remember the history that has led their society to where they are now. 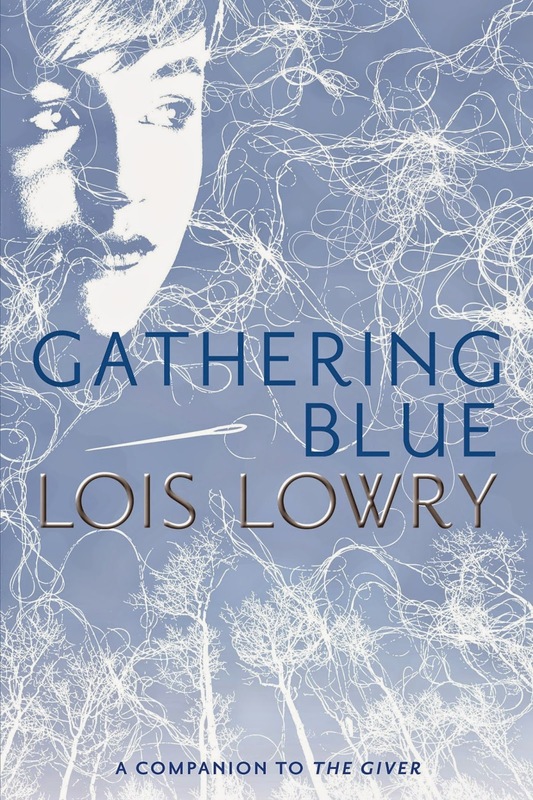 Gathering Blue by Lois Lowry is the second book in The Giver Quartet. It stands alone but if you want to read the next book in the series, you should read The Giver as well. Gathering Blue takes place in a different society than The Giver, but it's a similar idea ~ the society is secluded from any other, and there are some magical sorts of things going on. Kira is not the only child with a gift. She meets others as well, including Thomas the Carver, who is responsible for the Singer's staff. I enjoyed the world that Lowry created in this middle-grade novel. The diverse areas of the society are well-drawn, from the poor area where Kira's friend Matt lives, to the field where the dead are laid out, to the home of Annabella, an elderly weaver who teaches Kira where to find the different colors for dyes. The characters are also diverse and interesting. Their interactions are realistic, even if the world they live in is a fantasy. I especially enjoyed Matt and his little dog, who play an integral part in Kira's life, as well as Annabella, who is a wealth of knowledge for Kira. This was a great continuation of Lowry's story of these secluded societies, and I look forward to reading the next in the series, Messenger . This review was written based on a copy of Gathering Blue that I purchased. You should! The books are pretty quick reads. Ha! I understand. I have read many first books in a series and then not read the rest of the series. I do this even if I liked the book! I'm not a huge fan of series either. Nice review. A different and new author to me, but I do enjoy reading reviews about a good book. Thank you. I'm glad you stopped by! Oooh...sounds good! I am overdue for a reread of The Giver and want to read the rest of the books, too. Thanks for the review! You should do it! I'm glad I'm reading the series with C, so I have more motivation to finish it so we can talk about it. I love the Giver, I just found out a few months ago that there were more books after it. I have yet to pick them all up. Thank you for a lovely review. Makes me more motivated to pick up a copy. You should! I can recommend this one, and so far it seems my son likes the last two.